Winterfrost, a place of “unbelievable beauty and unbearable cold.” That’s how the land of Winterfrost was described by the gnomes of the Village of Twistedoak. They would tell tales of their perilous journeys to the land of ice and snow — a land from which some did not return. Every year certain gnomes were chosen by Azur, the Blue Witch, to find their way to Winterfrost Castle in search of it’s magic. 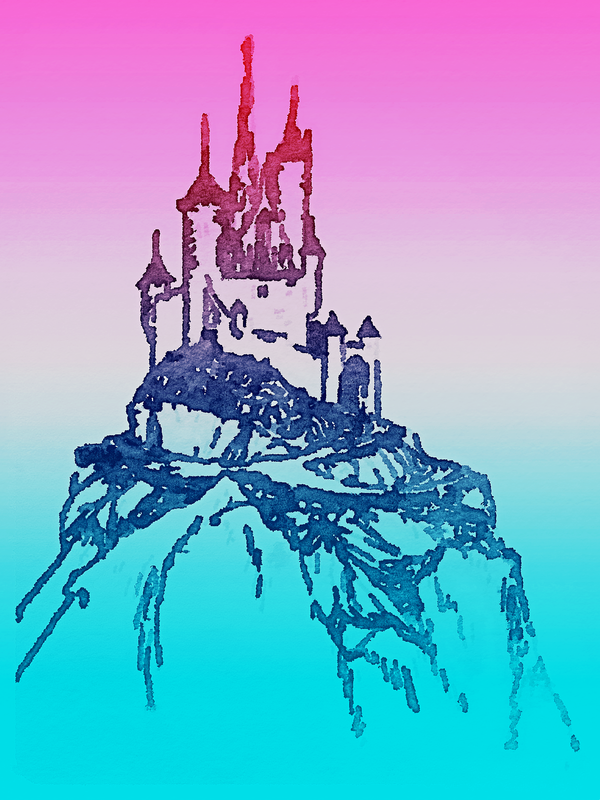 The magic that was lost when the wizard Azur, surrendered the castle to Queen Rose — the Red Witch. She once was Azur’s beloved. The chosen gnome was given only seven years to complete the journey. Few were chosen and even fewer returned. This one year, it was Phillip Tuber’s turn. The Tuber family were the founders of Twistedoak. They had settled the land many eons ago. Phillip was the youngest child in the Tuber lineage and until Azur’s visit, had lived his simple life as a farmer. His brother Phallow, was the first Tuber gnome that had been chosen by the wizard, almost seven years ago, and he had not yet returned. It was approaching seven years and time was running short. Phillip’s challenge, he thought, was to find Phallow but, as he would soon find out, it was about so much more. Another war was brewing. The war between Azur the Blue, and Queen Rose the Red, was beginning — again. The Red Witch wanted it all, complete power over all lands between Winterfrost and Twistedoak, not just Winterfrost — she already had that! Rose the Red had already devastated Azur’s armies, when first he tried to take back the castle. Now, she was slowly poisoning and razing all of the land, village by village. The Red Witch was jealous of the gnomes of Twistedoak, “Azur’s pets,” she called them. Azur had protected the gnomes for eons, with an energy field of blue light. The Witch hated their blue aura, and always tried to kill them off, but only if they left Twistedoak. She was sure they had that Blue Door — the Blue Door that was stolen from HER castle, and the reason for that aura. But, the people of Twistedoak did not have and knew nothing of the door, yet. The Witch’s mission was to find it, and so she went on. She and her hordes of goblins and trolls scourged the countryside burning entire villages to the ground, looking for the Blue Door. For every village destroyed, the Door was not found and Queen Rose vowed that she would “never” stop looking. For some mysterious reason, Rose never knew about the Village of Brokenfell, nor of the Ragworts. the tales and lore that the elders told, about the Azuric War. The young gnome spent many hours in Granma Polli Tuber’s vast library, at the Mushroom Castle, reading and tracing the origin of the folklore. Rawlink knew that the entire Ragwort family came from a long line of Warrior Gnomes and that some fought in that war. They were the gnomes that were only spoken about in the hushed voices of legends. Rawlink Ragwort was the most like his father. Like his father, “Poppa” Rollo Ragwort, he was a skilled woodcrafter and a master archer, and like his father, he stayed mostly to himself. Rawlink learned how important that door was. He had known something about its origin and where it came from. Poppa Ragwort had even told him about the engraving on it, but Rawlink had no idea about how powerful it was. Rawlink watched his entire life, how his father had cared for and protected the door. Poppa Ragwort entrusted Rawlink to keep it safe, when Poppa passed. So far, it was safe–safely protecting the home of the Ragworts in the Village of Brokenfell. The flames of the dragoneers had all but completely laid waste to the once lush forest surrounding Winterfrost Castle. The brave Warriors of Azur were forced to retreat. They had looked to the forest in hope of cover and rest. There was not much protection remaining, but they had to stop. Azur’s warriors were beyond exhaustion. The brave gnomes had fought fearlessly against the terrible army of goblins, trolls, ogres and the Red Witch’s chiroptera bats and dragons. They were no match for the evil witch’s magic. The dragons were trained to be killing machines, and the dragoneers, who rode the beasts had no mercy. It was kill or be killed. The complete destruction was a gruesome sight. The flying beasts even fought each other and used their own weak and wounded for bait. They knew nothing else but cruelty and death. The Red Witch made sure of that. Azur’s army was beaten. Their dinosaurs were starved and half frozen. There was no vegetation for them to eat. The dragons had made sure of that. The Warriors of Azur cared for their dinosaurs as much as they could, but in the end, the faithful beasts were released to wander in search of food and water. Perhaps, with some luck and a will to survive, they would be able to find their way back to Azur’s stable. burned. It was the best the warriors could do, and they did so with respect, honor and love. At least the wild animals and other creatures of the forest would not get to them. Finally, there was only one last sled remaining. It was the sled that carried the burned and injured body of Rollo Ragwort, the Commander of the Warrior Gnomes and General of Azur’s Army. He was near death, burned from a dragon’s blaze. Gen. Ragwort’s hands were burned as black as the night, almost to the bones. Still, he lived and was strong enough to encourage his brave band of gnomes and dwarves to move onward, onward past the burned-out forest and past the scavengers waiting for them to die. Onward they went, over the ice covered mountains and frozen tundra of Winterfrost, no longer the “ land of incredible beauty and unbearable cold,” as often foretold. Now, all around them, Winterfrost was no longer beautiful. It smelled of death, decay and fear. Azur’s troops had fought their way from Winterfrost Castle, through the swamps and muck. They were ravaged and starved. The bogs were infested with giant, hairy, brown tick-like creatures that attached themselves to the warriors and filled them with their venom. The hungry, injured warriors, dragged on for months until they found a large clearing. They saw a lea on the other side of Bandersnatch Swamp, where it met up with the Dark Forest. There were just few of the Warrior Gnomes still living — barely twenty, from an army of hundreds. Azur was nowhere to be found. General Ragwort knew, as soon as he saw it that this meadow would be a place for them to settle. The clearing at was a place not very far beyond the Dark Forest, but was where the ancient Warrior Dwarves had built monuments to their brave soldiers who fought in battles. The old monuments and statues were now buried deep beneath the earth, but some parts of them were exposed — perhaps from the wind and rain, or just from the settling of the earth. Hands, arms, feet and helmets jutted through the ground, raised towards the heavens in homage to the dead. Rollo Ragwort still commanded those soldiers that remained. He lay on his sled, which had at one time been a bright blue door. His hands were still badly burned, but healing remarkably well. The door had covered an entrance to the once private chambers of Azur and Rose. It was once adorned in diamonds, set in a pattern of the constellation Aquarius. The door had been torn from its hinges by Azur himself and thrown into the burned out gardens of Winterfrost Castle. The wizard wanted no reminder of that blue door. door was enchanted. Instead, carved into the door was an ancient faerie blessing that Azur himself had carved. It was a blessing, one of love and protection, and of health and healing. The door truly was charmed. It protected all who lived inside of whomever’s dwelling it hung. Being one of Azur’s closest advisors, Rollo recognized the door immediately. He had seen it after Azur had blown off the hinges. Although burned, injured and near death, Rollo made sure that the dirty, broken door was taken and used as a sled — his sled. So Rollo healed. His hands never showed any trace of the burns he had suffered. He and his remaining troops built a small village in the meadow and stayed there. They named the village “Brokenfell” to commemorate the fallen warriors and the broken statues. The gnomes used some of the hollowed out warrior helmets as dwellings. The helmets were sturdy and easily adapted. In his later years, Rollo became a master woodworker. He used the branches of the oaks and ash, from the Dark Forest, for his carving. The residents of Brokenfell said that anything that Poppa Ragwort carved was “magical.” Rollo carved vessels and toys, doors and shutters. His oldest son, Rawlink Ragwort, inherited his woodworking skill and used it to carve incredibly intricate and accurate bows and arrows. Bows and arrows that his father taught him how to use and that someday would be used, once again, against the Red Witch, to defend the Village of Twistedoak. The blue door hung in the doorway of the home of “Poppa” Rollo Ragwort in the small village he helped build, the Village of Brokenfell, where he and Nonna raised a family. He shared his story with his dear wife, Nonna, and his youngest son, Rawlink, but no one else. The longer the door survived, the more powerful its magic became. No harm would ever come to the Ragwort family or to whomever possessed it. The Red Witch also knew of the spell. She wanted that door back. Rollo had removed the diamonds from the door and buried them deep in the woods under a tree, in a place that Nonna and Rilefor, one of the Ragwort twins, spent time looking for healing minerals and plants. Poppa replaced the diamonds with crystal quartz He polished and shaped the quartz to fit into the abandoned holes. The town of Brokenfell flourished. There were a few of the cursed red mushrooms scattered throughout the fields, but the land was fertile. The gnomes and dwarves of Brokenfell raised their crops and their children. They were a happy, peaceful bunch. They lived their lives without worry or fear. Although considered odd, the Ragworts also thrived. Except for Nonna, the resident “nurse,” and happy-go-lucky Roscoe, they kept to themselves. An occasional passerby would stop to admire the door and the handiwork of Poppa Ragwort, but no one suspected that the door was enchanted. They did, however, believe that the house was. The Blue Door hung in the doorway for many, many years. It hung there until the elder Ragworts passed and Rawlink carefully removed it from the entrance of the family home. When the time came and the Rawlink Ragwort family decided to leave Brokenfell, Rawlink covered the door and mounted it to the underside of their wagon. The door travelled with them all the way to the Village of Twistedoak and hung, once again, protecting all who lived inside the Ragwort home. Continue the adventure with these books about the Ragworts of Brokenfell!